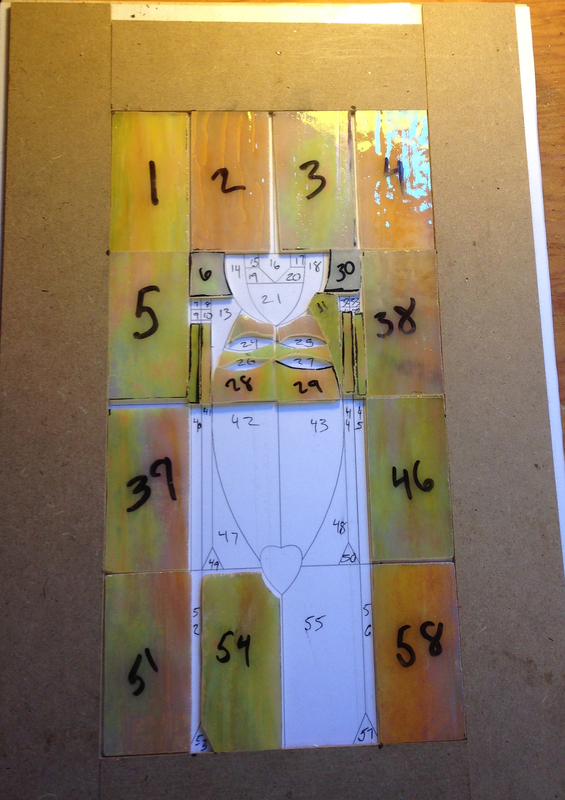 Yesterday I started on the stained glass panel for the door in the cabinet I’m making. I was surprised (58 pieces, shocked!) when I set up the pattern for the glass at the number of pieces it’s going to be a little more work than I anticipated. It’s also going to be kind of fussy work as some of the parts are pretty tiny, and I need to be careful to keep the main seams very straight and even or it will look “off”. 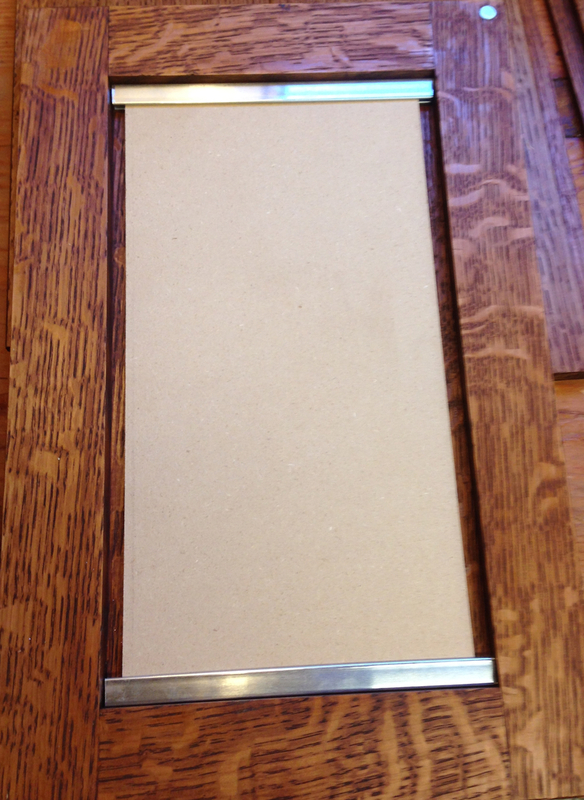 I started by making a test panel from 1/8″ MDF to make sure I had the size exactly right. 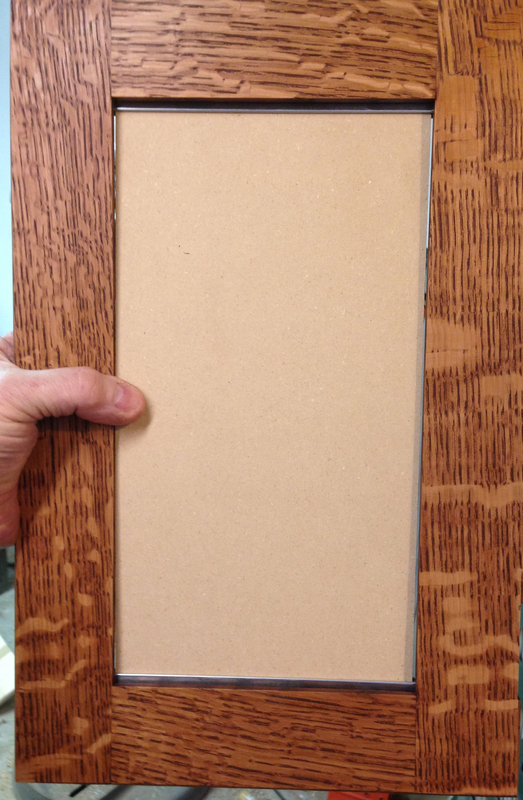 I sized the rebate in the back of the door so that about half of the zinc channel that will edge the glass will show. In fact, if everything is exactly on the money the panel should end up being the exact size of the opening. The zinc channel is about .550″ wide, with an internal stop for the glass that is about .330 from the outside of the channel — and I made the rebate .330 deep. 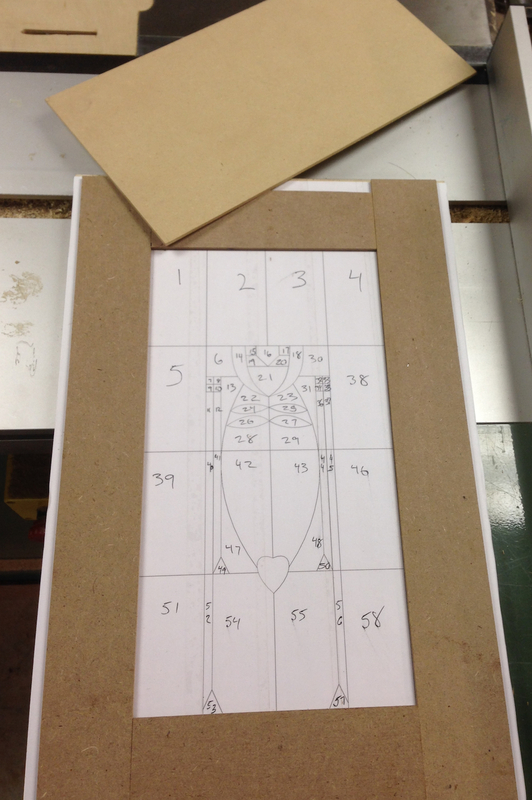 Checking the fit of the mockup for the glass panel – side to side. It’s a little loose and I needed to make the mock up a slosh wider. Next I set up the pattern board. I don’t know if other glass people do it this way, but I’ve found it works really well. What I do is glue the pattern down to a scrap of plywood. Then I layer packing tape over it to protect it from water damage – the glass grinder is water cooled and there are often several trips back and forth to sneak up on the fit. 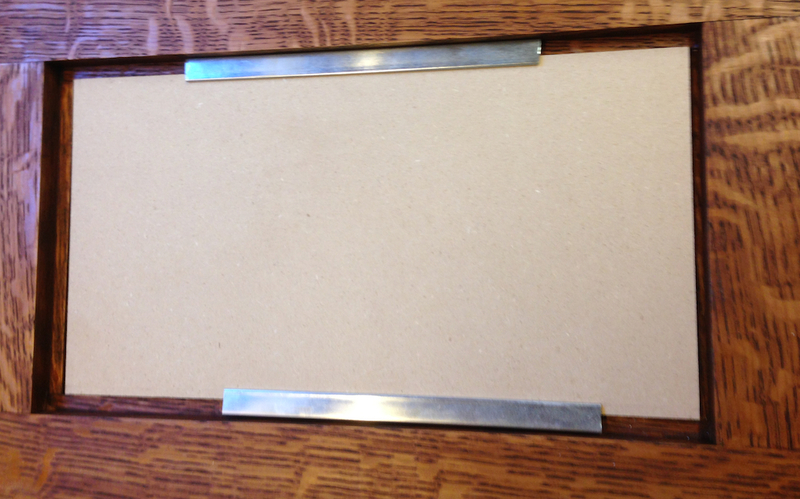 Then I staple a guide strip along one edge and use my MDF mockup of the glass to make sure the other three guide strips are square and perfectly sized. As long as the foiled and tack-soldered panel fits in the opening I’m positive it will fit into the door with the zinc channel added. Then I pressed my son into service to help cut and grind pieces. We worked an hour or so and made a good start on it. Next weekend we should be able to finish it (fingers crossed). As we add more pieces and foil it I’m sure we’ll need to adjust the fit, and probably re-make a few pieces. On this particular piece I need to have a really good fit on along all of the long straight lines, if they aren’t straight it will look sloppy. Gaps and irregular edges on the curved parts isn’t a big deal as long as it doesn’t end up with a wonky seam.